perspective on this election? If so, read on. In his book The Road to 9/11, now available in French, Professor Scott traces back the history of the ‘Deep State’ in the U.S., that is to say the secret structure steering defense and foreign policy behind the façade of democracy. His analysis lifts the veil on the group that organized the September 11 attacks and finances itself through international trafficking networks. Regarded as a reference book, The Road to 9/11 is already featured as recommended reading at military and diplomatic academies. as imperfect as the peace might be to hawks." ARE YOU AWARE that the 'Deep State' is the unelected power centers of the central government that continue on regardless of which person or party is in elected office? IS IT TRUTH that this election has been rigged from the beginning to 'elect' the candidate selected by 'Black Hats' of the 'Deep State'? WOULD YOU AGREE that both candidates are warfare state advocates but one is a proven war hawk who represents the dark side of the Deep State? The American people have had it with endless war ambitions of the 'Deep State' that never learned the lesson of Vietnam - the Imperial over-reach that led to the costly, drawn-out failure of 'nation-building' in the name of exporting democracy. The same pattern has been repeated with the Mideast wars that have exceeded Vietnam in murderous carnage, refugee populations, and length of duration. Most Americans and billions of global Netizens are tired of Imperial expansion, quagmires, proxy wars and 'nation-building' that ends up destroying sovereign nations abroad. Enlightened global Netizens are well aware of the 'Deep State' agenda to restrict sovereignty at home in the name of securing freedoms until we have neither freedom nor security - just a high surveillance police state. 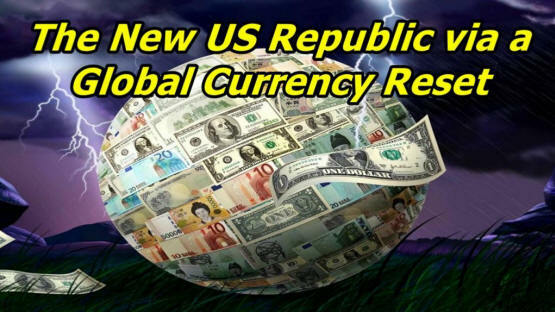 Global geopolitical and economic 'reset' is imminent. The Deep State is disintegrating while a New Order of the Ages is integrating. The Deep State corporatocracy media is NOT reporting this while they distract us with the election circus. EXCERPT: "China is going to release their gold holdings on or before September 30 as they agreed back in 2009 when they choose to reform the IMF and become the fifth IMF Special Drawing Rights (SDR) currency - which is a basket of currencies designed to form one global reserve currency along with the Japanese Yen (bankrupt), United States Dollar (bankrupt), British Pound (Brexit), European Dollar (bankrupt) and Chinese Yuan/Renimbi (gold backed). "You tell me which currency is the dog and which is the tail in this scenario?" Keep in mind the new standard of value globally - the VALUE of the golden rule/law language at the heart of the soft power gold standard for non-violent global transformation: Emerging Blueprint for a Golden Age. The FORM of the Next Economy - to be successful - will naturally follow the FUNCTION JUNCTION: the interactive interface for mass-to-mass TeLeComm with Web 3.0 CyberEthics. So consider how billions of global Netizens have become enlightened with our new Net reality opportunity to wise up and rise up for unity in diversity... for all of 'US' as 'United Sovereigns' of Earth. There's no getting past pathological history without a clear vision of global truth and love for reconciliation and healing. pre-planned intent and agenda that began the Iraq war. The Syrian war is not a 'Civil War'. in a systemic, gross and morally repugnant way. blaming the victims with baseless disinformation. for their actions and their words." the only thing we will end up with is increased evil. and immunity against disease: UltraMedics Services.